Mid-Atlantic Gateway: Win a Copy of "FOUR HORSEMEN" and a Phone Call from James J. Dillon! Win a Copy of "FOUR HORSEMEN" and a Phone Call from James J. Dillon! 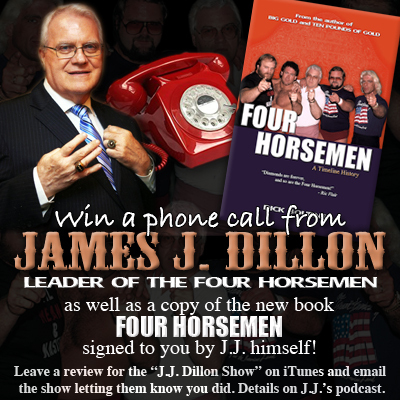 Win a copy of the book "FOUR HORSEMEN", signed by J.J. Dillon, and a personal phone call from J.J. himself. Post a rating and review of the "JJ Dillon Show" podcast in iTunes. Then email JJ at jjdillonshow@mlw.com and tell him in the email which review is yours. You are then automatically entered to win! Two winners will be selected at random and both will receive a copy of the "FOUR HORSEMEN" book signed to you by J.J., as well as a personal phone call from J.J. to say thanks. For more information, email that same address jjdillonshow@mlw.com or check out the most recent podcasrt (Episode #7, published 8/4/17) with all the information there. Don't miss JJ on his big Pennsylvania tour this weekend! He will have both his autobiography "Wrestlers Are Like Seagulls" as well as the new "Four Horsemen" book available at his booth or table. For more info call 610-798-9900 or email prowrestling1@aol.com. For more of J.J.'s schedule, click here.